Yes, you can create PDF’s using the software but who wants to fork out that much cash when there is a perfectly functioning piece of software that can convert virtually any kind of document, image or spreadsheet into a PDF quickly and easily without spending a cent? So put your Visa card away and download CutePDF now. The Free version is a cut down version of the Professional version but should suit the needs of most users perfectly. That said, a license for the Professional version will only cost you $50. The software includes a User’s Guide which will guide you through using the software effectively but essentially it works by installing a new “printer” on your computer. 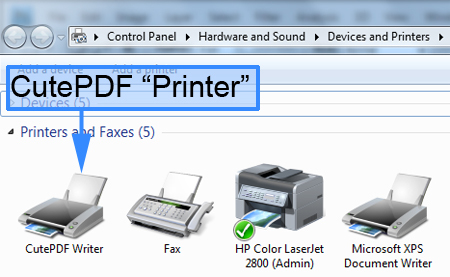 This is obviously not a printer that prints on sheets of paper but it instead “prints” your documents to a PDF file. All you need to do to use the software after it is installed is open the document you wish to change in to a PDF and print it to the CutePDF printer, you will then be prompted to save the PDF file to your computer, press the save button and you are done. It doesn’t get much easier than that! Any document you can physically print on paper you can convert to PDF using this method. You can read reviews for CutePDF Writer and the other writers from Gizmo’s Freeware site.